The trusted source for Los Angeles auto glass repair, PG Auto Glass, fills the local area streets with mobile auto glass repair trucks that respond to the majority of glass repair calls. To further assist the customers, PG Auto Glass is now offering a special promotion as a thank you to customers. Every customer will now receive a $10 immediate discount that can be applied to any repair or replacement services. Auto glass repair services may not be the first thing on the mind of a person that has a daily schedule filled with important tasks and activities. The summer is now in full swing and this means more travel for the average person. This is the time of the year that auto glass repair services are the most important. The chance for a collision, accident or vandalism is always increased in the summertime. PG auto glass repair in Los Angeles stands ready to take action when damages happen. The millions of residents in the LA county area fill the local roadways and highways every hour of the day. Auto accidents and collisions happen frequently and glass damage cannot be prevented. Individuals and families that are beginning to travel for the summer need a reliable source to call when glass is broken or damaged during a trip. With PG Glendale auto glass repair finding a service at any time of the day and any day of the week is not a problem. Experience in the auto glass industry is what makes some companies better than the rest. Planning in advance for any glass problem takes the stress away when problems do happen. 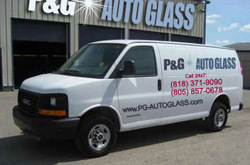 PG Auto Glass is a leader in mobile auto glass repair for LA county and the surrounding areas. Every repair and installation includes a lifetime guarantee against breakage or leaks. By providing 24/7 services, PG Auto Glass has earned a reputation for prompt attention to emergencies and expert technicians that complete every job professionally.